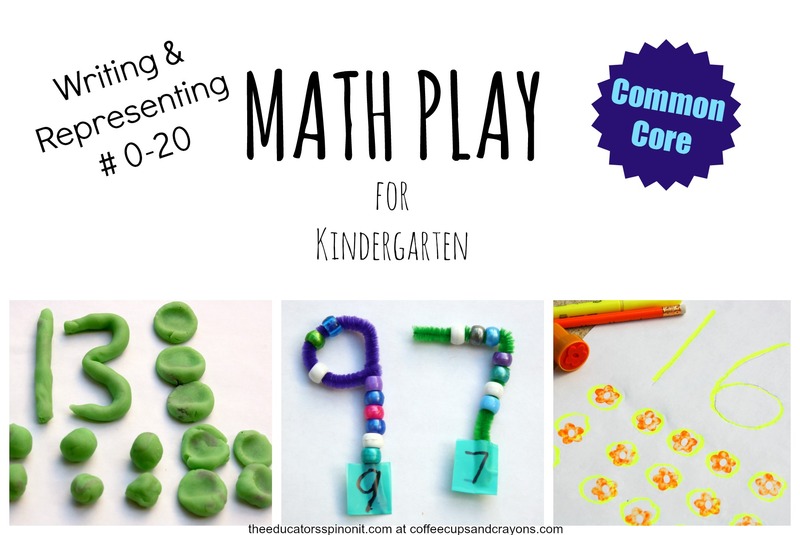 Make learning fun with these Kindergarten math games and activities for learning to write and represent the value of number 0-20. Playing with math concepts and using hands-on games is a great way for kids to internalize math concepts! The Importance Of Hands-On Kindergarten Math at HOME! Close your eyes and see if you can imagine a classroom full of energetic 5 year olds (26 of them to be exact) with one awesome teacher who has passed out learning manipulatives and is teaching the children how to write and make numbers 0-20. I am sure you have pictured a busy scene full of math talk and moving plastic counting bears or unifix cubes. I’m also sure you can imagine that each child in that room would benefit from extra one on one time with a teacher. That’s where parents come in! Yes, parents, in my opinion area child’s first and most important teacher. Kindergarten is a busy year, filled with TONS of learning. This is the year that starts the foundation of many academic skills. Kindergarten students need many opportunities to interact in meaningful ways with these academic skills. There is just not enough time in the school day for everything. It is important to help your child find success with these skills, while still having fun! 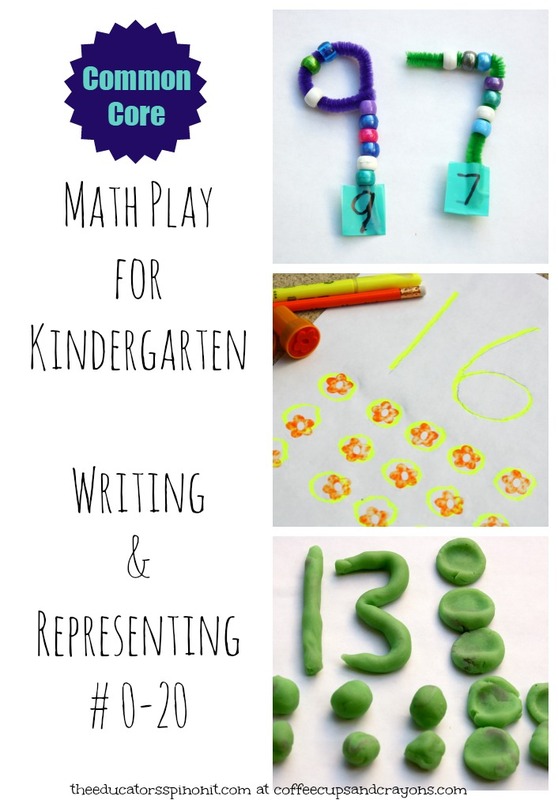 Writing numbers and understanding their value is such a vital beginning math concept. Soon, children will be manipulating these numbers with addition, subtraction, then multiplication and division. The Common Core Math Standard CCSS.MATH.CONTENT.K.CC.A.3 states that kindergarten children will write numbers from 0 to 20. It also says, that they will be able to represent a number of objects with a written numeral 0-20. So what would parents be doing at home? Cut each craft wire in half. Tape a section of tape to the bottom and fold over with sticky sides together. 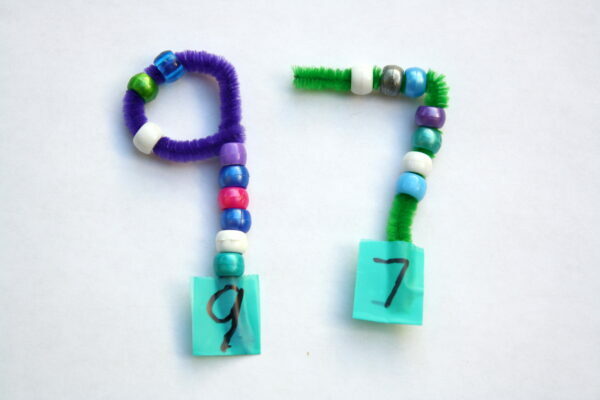 Have your child put the same number of beads on the wire as written. Then, have them shape the wire into the shape of the number. Challenge: Make all the numbers 0-9 and put them in order from least to greatest. 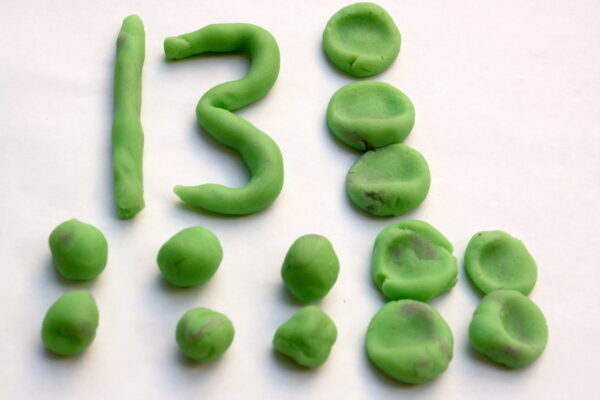 Roll the dough into snakes and form the selected number. Then roll the same number of balls (or spheres) needed to represent that number. When the child is done, they get to smash each ball. Counting as they smash! This activity is great for kinesthetic learners! 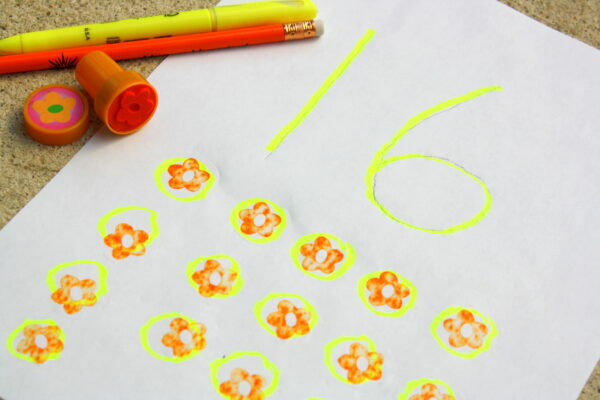 Pre-write with a highlighter the number and circles representing the number if the child needs this support. Omit this part if the child is able to write the numbers independently. Have the child write or trace the number. They then stamp the same number of times as the number. Once completed, have them count each stamp. Amanda Boyarshinov is a master teacher and one of the bloggers behind the parenting and education site: The Educators’ Spin On It. She shares her teaching knowledge with parents everywhere through her creative, inventive articles. So many great ideas. I’m always looking for ways to learn and have fun at the same time.